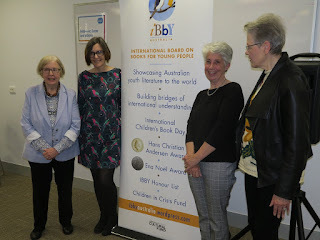 Nella shares a rare treat to view the IBBY Honour List at a recent event in Canberra. How do you deal with Book Lists – best of 2018, best YA, best picture book etc? Eager to see if your favourites made the grade, use them to add to your TBR pile or avoid them for fear of being overwhelmed? How about the exquisite joy of being surrounded by such a list and being able to hold/read the books? The IBBY Honour List is a biennial selection of outstanding, recently published books, honouring writers, illustrators and translators from IBBY member countries. The 2018 Honour list has 191 books in 50 languages from 61 countries. IBBY Australia began nominating its own creators for the Honour Books in 1962. Australia’s first Honour Book (nominated by its UK publisher) was Nan Chauncy’s Tangara. The Honour books display had never toured Australia until October 2018 when IBBY Australia and National Centre for Australia Children’s Literature (NCACL) combined forces to host the display of the Honour Books 2018 (on loan from Basel, Switzerland), a display of all the Australian IBBY Honour books at Woden Library and to present the Sharing Stories program – a celebration of Australian children's book creators and translations. First stop - some of the mini exhibits - Bob Graham’s Max at Dickson Library and at Woden Library - Alison Lester‘s Noni the Pony & Noni the Pony at the Beach, Bob Graham’s Let's Get a Pup and Margaret Wild & Wayne Harris’ Going Home. Then the exhibition preview to hear Dr Robin Morrow AM, National President of IBBY Australia, talk about Australian Books about Refugees; and IBBY’s Call-to-Action, Claire Stuckey, Executive Committee member of IBBY Australia, Comparing and Contrasting Australian Indigenous Picture Books with Non Indigenous Titles featuring Rural and Urban and then Ursula Dubosarksy’s wonderful introduction to IBBY and to the exhibit. And the last Sharing Stories event for me, the official launch. Emeritus Professor Belle Alderman AM, Director, National Centre for Australian Children’s Literature, commenced proceedings and ACT Minister for Multicultural Affairs and Minister for Community Services and Facilities, Chris Steel welcomed guests. Jackie French shared her experiences with translations – the challenges and the joys. There are plans for the exhibit to tour other libraries. If it comes near you, don’t miss seeing it. Even if your French is rusty, I am sure you will enjoy this presentation of Adrien Parlange’s Le Ruban, a French Honour Book. Let’s hope Gecko Press or Berbay Publishing decide to produce an English version. Nella what a great experience it must have been to view the IBBY Honour List books, and we look forward to more posts about the interesting activities of IBBY.